In stock - low quantity. Order in the next 17 hours, 54 minutes and it will go out today! The magician asks an audience member to borrow a dollar and a quarter. Placing the quarter on top of the bill, the performer starts rubbing in a circular motion, as if to rub the quarter through the bill and even the table. The magician stops and removes his fingers from the bill to reveal that the quarter has fused with the dollar bill! 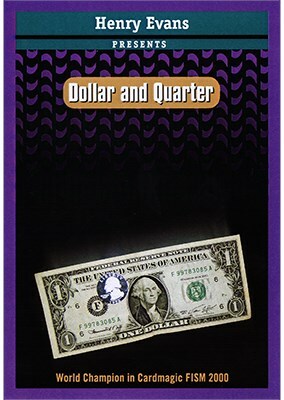 The dollar is handed to spectators to verify that the bill is real and that the image of the quarter is not a simple sticker! Amazing! Comes complete with Dollar gimmick and detailed, photo-illustrated instruction sheet.